A community library that holds the community together. 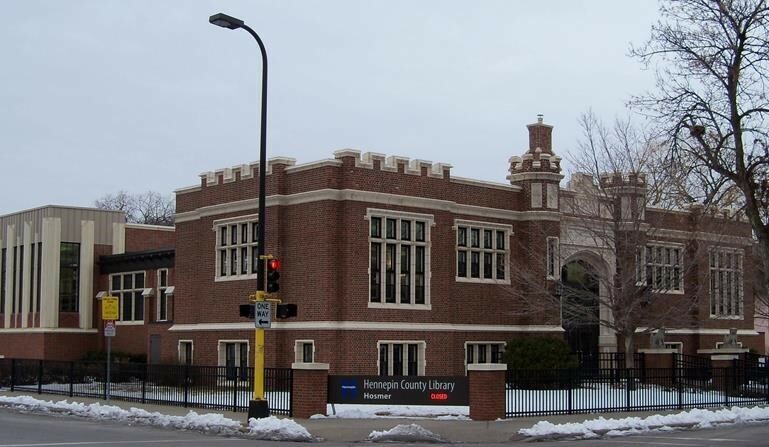 Hosmer Library was built in 1913 during a period of rapid immigration into Minneapolis. The library was used often by students from Central High School, one block away, which opened in 1916. (Central High was closed and mostly demolished in 1982; only its gym still stands). Hosmer was one of 13 libraries built under the leadership of Minneapolis Library Director Gratia Countryman and was financed with support from the Carnegie Corporation. Beginning in the 1920s, as the neighborhood's African-American population increased, the library was used as a meeting place by organizations including the State Federation of Colored Women’s Clubs and a men’s organization called the 13th Ward Improvement Association. Originally, the building included a “sun room” on its west side, which, in 1969, became the “Afro-American Room” to house books by and about African-Americans. In 1971 the Urban League Street Academy, an alternative school, moved into Hosmer's basement with 65 students. Stylistically, the building is Collegiate Gothic, which, as the name implies, is often used for school and university buildings. Hosmer’s Tudor Gothic-arched entrance and the crenellations (faux battlements) at the roof line are typical of the style. Flanking the front entrance are two granite lion dogs (a misnomer created by Westerners; in Chinese tradition, they are guardian lions). A 1997 addition to the south side of the building was designed by the Minneapolis architectural firm of Meyer, Scherer & Rockcastle with Jeffrey Scherer as principal in charge. The addition approximately doubled the library’s space. Hosmer Library is open to the public. Chip Gehring and Richard L. Kronick, “Hosmer Librray,” Minneapolis Historical, accessed April 18, 2019, http://minneapolishistorical.org/items/show/173.